The third miner has just surfaced. If you aren't watching, turn it on. It's heartwarming and real. Everyone is calm and joyous. 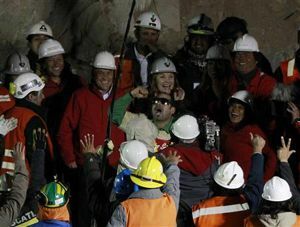 The President and First Lady of Chile are right there, they seem so down to earth and connected to the relatives, the workers and the miners. Watching the President physically bear-hug the miners as they emerge is amazing. His smile is a mile wide. The emotion on everyone's faces is palpable. It's rare to see such expressions of pure joy these days. A lot of expertise and planning went into this rescue and it shows. Congratulations, Chile (and those from other countries who helped.) You've done yourselves proud. The world is watching and we are all impressed and smiling with you.